This op-ed was originally published in the Chronicle Herald. KJIPUKTUK (Halifax) – The Nova Scotia government’s 2019-20 budget which came down on March 26 is not only balanced but posted a surplus. So the government has dealt with its fiscal deficit. 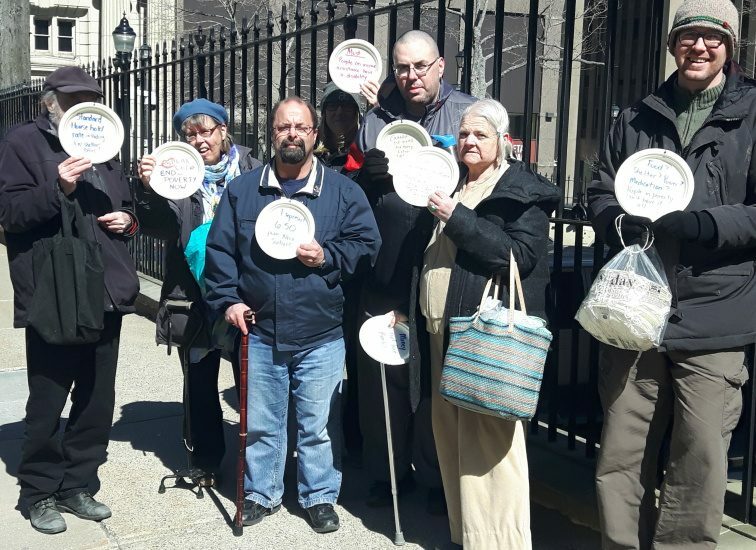 But judged by the limited investment in community options for persons with disabilities, long-term-care facilities, and financial assistance for the poorest of the poor, the government is not adequately dealing with its growing social deficit, now seriously affecting Nova Scotia’s most vulnerable: persons with disabilities, the frail elderly, and low-income individuals and families. Others will no doubt speak up about the first two issues; Nick Jennery of Feed Nova Scotia and SaltWire columnist Jim Vibert have already weighed in on the lack of attention to poverty overall with excellent pieces in the March 30 edition. But here I want to focus on the Department of Community Services (DCS) Employment Support and Income Assistance (ESIA) program and its so-called “transformation” process, supposedly intended to improve conditions for people on income assistance. To be sure, transformation initiatives such as the improved wage retention policy, more training and skill development programs, and a free bus pass in HRM will enable some income assistance recipients to find paid employment to supplement low welfare benefits or leave income assistance altogether. But they face poor labour standards, including one of the lowest minimum wages in the country, and a labour market now largely based on contractual or precarious employment. Many (around 73 per cent, by one estimate) will likely have difficulty finding or sustaining employment due to physical or mental health disabilities and/or literacy and educational limitations. And if and when they become unemployed, under current rules, ESIA will claw back every penny of their employment insurance. Another basic piece of the transformation agenda is to create a Standard Household Rate (SHR) for income assistance. This will combine the shelter allowance (for rent, heat and so on) and the personal allowance (food, clothes and all other personal items) into a single amount. The rationale is to simplify administration, ensure recipients receive what they are eligible for within the parameters of the regulations, and introduce some flexibility in how clients choose to budget their money. But here’s the rub: the shift to the SHR, along with a promised rate increase, does not come into effect until January 2020. Depending on what “category” of assistance a client qualifies for — single employable, single disabled, couple with or without dependents, single parent and so on, and what shelter rate a client is “entitled” to under the regulations — welfare incomes are currently anywhere between 27 per cent and 60 per cent below the Market Basket Measure of Poverty (MBM), an absolute measure that defines how much money is required to live at a very basic level. Since there is so little money in a client’s budget to begin with, budget flexibility will not mean very much. Years of no increase in the shelter rate, a two-year rate freeze between 2013 and 2015, increasing costs for food and shelter over this decade, and only small rate increases between 2016 and 2018 mean that a five per cent proposed increase for persons with disabilities and those fleeing abuse and two per cent for everyone else for the SHR in this budget will not enhance the real value of income assistance or meet basic needs. With an implementation date of January 2020, it is effectively another freeze on welfare incomes. One excuse the government has offered for not bringing about the SHR sooner is that it needs time to prepare for implementation. This may be so, but the proposal has been part of the transformation agenda for more than two years. Moreover, there were other instruments at hand to fill the income gap. The government could have increased the amounts and ceilings of the Nova Scotia Child Benefit intended to supplement federal Child Benefits for those on very low incomes — this has not seen an increase for a number of years. It could also have increased the Poverty Reduction Credit, a limited supplement (now $500 per year) for individuals without dependents whose welfare incomes are the lowest. It’s more likely that the real reason for the delay is that in the nickel-and-diming tradition of ESIA and in an attempt to keep increased costs to a minimum, bureaucrats need time to sift through case files or call clients in for a review to verify the accuracy of their regulation-related entitlements, or check on obligations to participate in employability programming. To be worthy of the name, ESIA “transformation” should go beyond tweaking and address the basic assumptions underlying income assistance as it developed in the last century. Instead of punitive regulations and an outdated categorical budget deficit model that pre-defines “need” but keeps people constantly “in need,” we require a social safety net and service-delivery model worthy of the name. How about one that rests on social justice, human rights, and community well-being? This is an approach to poverty that recognizes the benefits of investing in affordable and social housing, literacy, education and skills development, and strong social and health-care services that use social determinants (health equity) approaches. Such a shift also demands governments interested in equitable income redistribution rather than just economic growth, and for all those who care about ending poverty to call the Nova Scotia government to account for the growing social deficit. Stella Lord is co-chair of the Community Society to End Poverty in Nova Scotia, a group that advocates on issues related to ESIA transformation. The views expressed here are her own. A Poverty Reduction Credit of $500 a month would be a start. Even then, ESIA recipients would still be living below the poverty line. Those with special needs amounts would be hovering at it or just above depending on how much extra they get each month. The government needs to look up the definition of “transformation”. That’s not sarcasm. I’m serious. It means, “a thorough or dramatic change in form or appearance” Do they think we are supposed to be impressed? There is not one dramatic or thorough change being made to ESIA. Okay, so we get an extra forty bucks. How it’s placed in our budget or what fancy word you use to call the total sum, it’s just a tiny bit of money. Over the last 30 years, we’ve had not much more than $40 worth of increases given to us a few dollars at a time, the “big” increase of $20 three years ago. For people whose rent is most of their cheque, the Standard Household Rate means nothing. Actually, it means nothing to anyone unless, UNLESS, they allow us to keep what we don’t spend on rent. For example, say your rent is only $300 because you live in subsidized housing. So, currently, of the basic amount, you’d only get $235 for rent instead of the full $535. (This is for a single person with a disability.) After they no longer consider a part of the SHR to be for rent, do we get to keep the whole amount even if our rent is less than $535? If so, then this is not fair to those of us who spend at least $535 on rent. Not everyone can move into subsidized housing as there aren’t enough units available and/or it’s not suitable for whatever reason. Having tried it already, I know I cannot live in public housing so I’ll never have money left over from rent I don’t have to pay.